I don't make 2 posts a day, but I thought the current post was rather a progress report on the blue project than a real post. So I provide a post here and will keep such reports to Saturday-Sunday. Tobold wrote in a comment: "think you are inventing a distinction here that doesn't really exist. I do not spend part of my time writing "quality content", and part of my time writing "rants". I'm writing "whatever thought is in my head" content all the time. The reason why I can't just decide to only write "quality content" is that if you'd ask people which posts exactly are quality and which aren't, every reader would give you a different response. Some people only read my WoW posts, others hate my WoW posts and only read when I write general game theory. Some even prefer my more personal posts to dry analysis." I think he is completely wrong about the existence of "quality content", while completely right about the people's different preferences about different kind of quality contents. Some might interested in "hunter changes in 3.3.3" others not. Some are interested in "the future of unconsentual PvP games", others not. This made Tobold (and many others) that every topic interests someone and all topics are therefore equal. It's wrong. It's true that quality content does not interest everyone. However we can differentiate it from "not quality content" that interests no one. Quality content provide answers to questions that people has or will have some times. For example the post about Tobold's PS3 tribulations warns every prospective PS3 buyers and also provides a dirty but working solution to those who already have a PS3. Does it interests everyone? No. Does it directly affects me? No, I don't have a PS3 or plan to have one. However his pieces of information warned me about a class of problems (localization in an international world) and a clumsy but working solution that can be used in several cases. Accurate (even anecdotal) research of an existing object in the world is "quality content". Are you interested in the "MCSCF simulation of the syncronous proton transfer in lipase protein"? 99.999% not. However I doubt that besides a handful of retards would call this scientific paper "worthless". There are many things in the world so there are many ways to write quality content. However there is a big class of things that people like to talk about, yet guaranteed that no one cares about: their own (or some other guy's) "self", their psychological construct of their being. Some people will care that PS3 doesn't let you play English language games outside English-speaking countries. But no one will care that this event caused you to be mad. Some people will be interested about your analysis on WoW vs Darkfall. But no one (besides the participants and those who have emotions towards them) care what you think of the person of Syncaine or what he thinks about you! Clarification: the above line was improperly emphasized. It should be "No one cares about what you feel". There are artworks and posts that generate feelings in the audience, and they sell like candy. But these are the feelings of the audience and not the creator. Honestly Gevlon, you're talking about your own preferences here. I'm not so sure that you can speak on behalf of the entire blogosphere community. You like dry, analysing blog posts. Other prefer a more intense, emotional way of writing. Take Tam at Rigthteous Orbs for instance. 99 percent emotions there and 1 percent analysis. (yeah, I'm exaggerating a little). And yet he's done a fantastic break through as a blogger and I'd dare say has had quite an impact through his writings. We're all looking for different things in blogs. Personally I prefer a mixed diet, which you'll see if you check out the blogs on my roll. Some of them are very dry and information/analysis oriented. Others are emotional, personal and just damned good reads because you get the opportunity to look into the mind of someone else, and sometimes you nod and think "that's how I feel too" and soemtimes you think: "oh, can people think and feel THAT way? I never knew that". All of the blogs on my blog roll have some sort of quality in them. Even though this certain quality may not be the kind of posts that you prefer. Actually, I'd say most people spend a lot of time trying to understand their own and other people's feelings. This is not a worthless activity, because apart from some robot-populated (dis/u)topia those feelings are what drive people's eventual behaviour - there are many psychological studies that prove this. No matter how much you'd prefer it to be otherwise, generally rationality is used post-hoc to justify decisions already made, not the other way round (yes, even for you, Gevlon). With that in mind, reading about how someone feels, especially someone who has made decisions (or wrote analyses) that you respect, or has been through similar experiences to your own, can be a valuable activity. Hehe, Gevlon just defined quality by what other people think :D Very social of you Gevlon. My two cents is that quality in communication, be it art, books, papers or blogs, is in the eye of the beholder. Quality is a word invented by us to try to quantify how good(?) we think something is, and to say there are rules to this implies that you believe there is some form of authority on human thought. Or if that's not the case, you might believe there exists some kind of true way of thinking and behaving. True goblins define quality in the same way Tobold does. 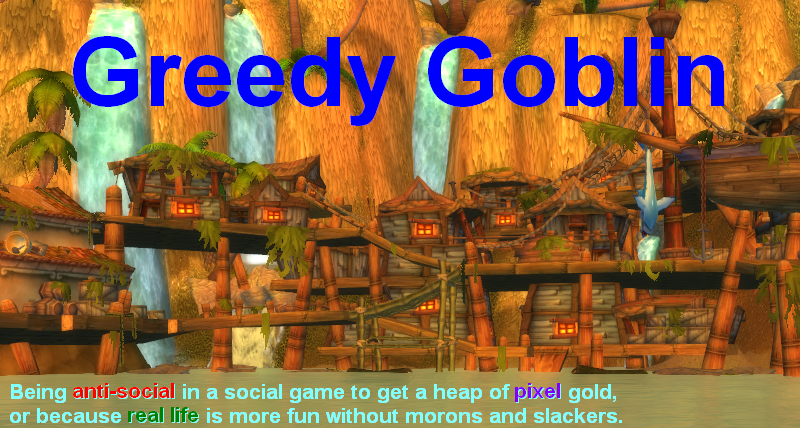 Gevlon, I consider on your blog only the World of Warcraft economy advice is quality content. Your philosophical post and morons & slacker rants are exactly the "psychological construct of your being" posts I don't care about at all. Nevertheless those posts are what defines you, what makes you different from other WoW economy bloggers. So while I don't read your posts on how everbody else is an idiot any more, I wouldn't ask you to remove them from your blog. Oh, and if people weren't interested in reading "psychological constructs of their being" from authors, half of the world's novels wouldn't exist. The philosophy posts are either analisies of how they work or solution offers to how to handle them. Of course I don't question that some of them are wrong. Nor I doubt that sometimes I write with emotions. But it doesn't make emotional posts worthy. It just make that post unworthy. I'm fully aware that I'm imperfect, so simply pointing out that I fail the same way won't make me stop calling it "failure". "No one cares about what you feel (personal emotions, preferences and such)"
Like a few others, I beg to differ. While it may be of interest to 'socials', there is large amounts of real life money made on the back of 'how you feel', whether it is TV, movies, books, magazines etc. I must confess to liking the various posts around regarding Mr(s) gogogo, 500dps. I get some comfort (and vicarious enjoyment) out of reading that I am not the only one who (a) gets these toons, and is anoyed by them. * How well it entertains. While the criteria are somewhat arbitary, if you fulfill all 3 of the above you have a 'quality' article. If you fulfull none of the above, you probably dont. Wonderful post. Shedding some light onto a possible categorization of blog posts is of value, especially in a fast expanding universe such is the blogo-sphere. Post topics can be aligned on the objective-subjective axis, which bears a strong correlation to what you define as quality. To simplify a generic blog topic can be described as a statement (be it observation, judgement, analisys) about an event (be it a person, a situation or any kind of information). As such, you can have objective or subjective statements about objective or subjective events. I believe that a high quality post is one that provides an objective statement about an objective event. These are the events that concern everyone and the analisys is an informed fact rather than a personal opinion. Everyone cares about these. - stat weight suggestions in regard to patch notes. "Dear wow.com, my arena partner told me today he is thinking about suicide... what should I do"
"should the healer rez people after a wipe"
- "Yesterday, in the ICC25 pug Bryntroll dropped, and I won, yey!" Simply tabloid topics with purely an entertainment purpose. This is one way to look at quality of an article. The affect it has on you as an individual reader. Except keep in mind, if you get no benefit of any kind from reading an article or blog post, that does not mean it was not quality - it just was not worthwhile for you. This is where we need metrics to gauge whether a blog post is quality. The main metric which comes to mind is 'how well does the blog post achieve its intended goal'. But then, if a given blog post is just somebodies thoughts - with no thought given to their effect, perhaps there isn't an intended goal? @Foo: Those are your criteria and probably those of 30-40% of the readers. What Gevlon is saying is that it's more likely for a person who comes to his blog to tell that a post which was not entertaining but informal (your criteria was not met) still the post for this individual was a 'quality' post, as Gevlon wrote something useful for that person. For me the posts with real world connected discussions are more worth, they will be 'quality' for me. Don't you think? I think your on the right track, something can be 'quality' or not regardless of the size of the intended audience. The scientific essay you mentioned could actually be complete bull, in which case I'd say, despite it sounding impressive, it's not quality. Then again it could be well researched and quality. Also something can have a huge audience and still not be considered 'quality', is all pop-music 'quality' by simply having a large amount of listeners? Trashy romance novels? They certainly interest some segment of people, but I don't think anyone considers them high literature. Also about the 'feeling' issue. Because people are largely empathetic, we do care what the author feels. By the author being able to express their feelings well, we can experience them too. The only reason those pieces evoke feelings in ourselves is because the author/artist managed to express their feelings. While I'm certain some pieces were created dispassionately, I bet even with you your more 'quality' posts are the ones you care about or have more invested in. I subscribe to the Selective Exposure theory of Mass Media. This is what makes or breaks the definition of "Quality" in regards to blog articles. Thanks to this sort of behavior amongst readers, the Wall Street Journal can coexist peacefully with "rag" tabloids about Bat Boy. Bloggers would be doing their readers a disservice by refraining from posting their feelings on a topic just as much as if they chose to write ONLY about their feelings while leaving out facts or anecdotal evidence. Whether it's reviewing a movie or videogame, or informing the public about a horrible PUG gone wrong, readers tend to gravitate towards these emotional posts. Depending on what the reader is attempting to gain, it could be because they have no opinion and therefore rely on other sources to form one for them (Magic Bullet) or perhaps it's because they find stimulus in finding an opinion they can agree or disagree with. The QUALITY found in the post has little to do with the topic, but more in how the article is framed. Try replacing the word "Quality" with "Accuracy and Depth" and I think you'll find the real reason that some blogs (and any form of media for that matter) are successful. Robert M. Pirsig wrote a lot about the concept of quality in his two books "Zen and the Art of Motorcycle Maintenance" and "Lila: An Inquiry into Morals". A "Social" I may be, but I actually like reading those "I rolled this class, and it feels like this posts" or the "This happened to me, and this is what I think about it" posts. It really helps to break up the normal analytics I normally read. Ohh well to each his/her own. Awesome thing about the Internet, if I don't want to read it, I'll skip to the next post. With the feelings post, I think you're right with 'no one cares what you feel' but they care very much about what THEY feel. So if you write something which reminds someone of something they felt, or makes them feel something else, then you get a lot of traction. And one way to do this is to describe your own experiences in a really vivid way. I do think of some of my posts as being higher quality, and usually they are the more thoughtful or analytical ones. But I still hope that even the random rants are reasonable quality. And I know that some high quality posts just disappear because no one else was interested. To clarify, Gevlon, are you saying that philosophy is worthless? Part of talking about how you feel, can help others understand how they feel. If I write something, and someone doesn't like it, then that is a valid statement. But if they are unable to tell me why they don't like it, then the statement is nearly worthless. Part of the experience of them not liking something is how it made them feel. Did what you write break the trance they were in, did it make them feel angry at the character so much that they refuse to read more, or was it just so stupid that they threw something (thanks to some ape-subroutine). You best recent post: When your banker got ganked in Booty Bay, and you talked about how you laughed about it, and how you handled it. That was not failure by the way. By sharing your feelings and how you reacted to them, you actually can cause others to act the same way, because they'll remember how you reacted, and apply the same reaction in their similar situation. Anonymous beat me to it, I was going to suggest you read Pirsig. Give it a try, you'll at least learn a little about quality. According to your usual analysis method you should need to know how to measure "quality". Your current measure of quality is a subjective approach. IMO Larísa is one of the finest examples of quality content that doesn't necessarily provide answers. I'm going to hazard a guess that you were a physicist or chemist in another life Gevlon - quantum chemistry indeed!